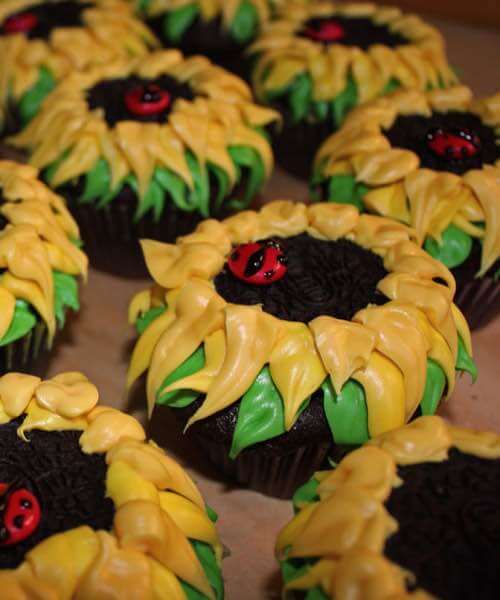 Here's a whole bunch of cupcake decorating ideas you'll want to try. 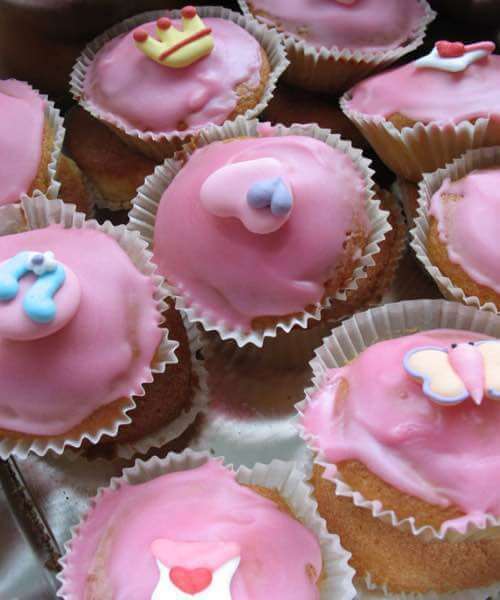 If you've just baked a batch of cupcakes and now you're wondering how to decorate them, or you need a dozen prize winners for a bake sale, do NOT panic! Simply look below for some inspired ideas you can use. You don't have to be a Martha Stewart to create some pretty looking flower decorations for your homemade cupcakes. To begin our cupcake decorating ideas, you'll find these icing flowers are simple and easy to make. For the blue flowers on the cupcakes shown above, use a No. 12 tip on your decorating bag and make a small mound of dark blue icing in the center of your cupcake. Then use a No. 16 tip to make a small cluster of long star shapes at the top. Then starting around the edge, use No. 18 tip with light blue icing to make the petals. Work around in a circle and then make another row above, until you come to the topmost flowers. 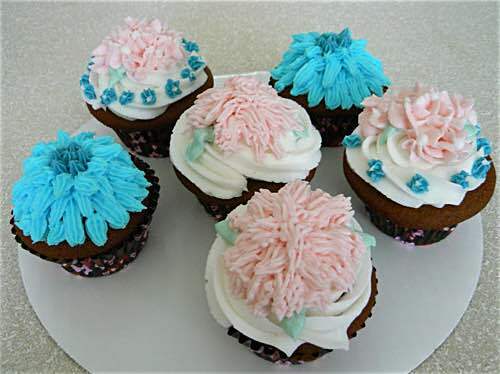 For tiny blue flowers on the pink and blue flowered cupcake above, add a few pastel-green leaves and use a star tip (No. 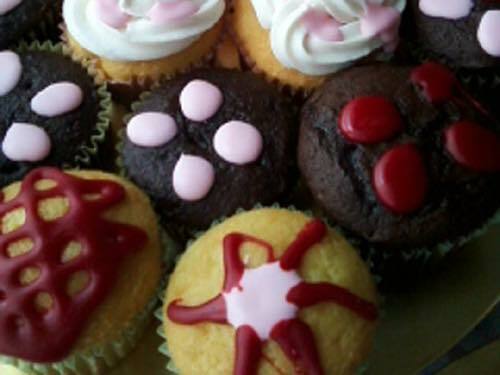 16) to create small flowers around the cupcake's edge. Then use a small round decorator tip (No. 3) to add a white dot to the center of the tiny flowers. For the shaggy pink flowers, begin with a white swirl base, then make your light-green leaf shapes with a leaf tip (No. 352). Then use a multi-opening tip (No. 233) to make the shaggy pink petals. Beginning from the outside, make a circle. Then make another circle further in, until the entire cupcake is filled. These icing sunflowers look tricky, but you'll be surprised at how easy it is to make them. All you need is a bit of icing on the top of the cupcake, topped with a chocolate OREO cookie. Use a leaf tip (No. 352) to create the green leaves on the bottom. Top with 2 more rows of yellow leaves. Finally, for the pièce de résistance, add a tiny ladybug royal icing accent. Here's a simple yet elegant idea. 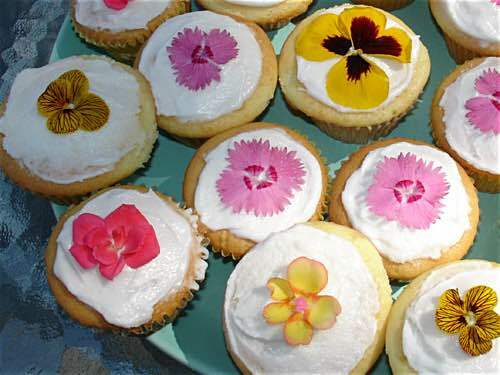 After icing the top, each cupcake is crowned with an edible flower from your garden. Just make sure the flowers are organically grown and food safe; that they haven't been sprayed with any harmful chemicals or fertilizers before adding them to your cupcakes. If you're wanting a very specific design or shape, you can do what bakery chefs have done for years and choose a fondant icing. Select a store-bought fondant, or you can make your own fondant in the colors you want. The dough-like fondant lets you mold a variety of shapes or cut out specific shapes, and more. Sometimes just a little icing accent can make a cupcake stand out. These are examples of the royal icing decorations you can purchase ready-made at your local cake decorating shop, or you can make your own using candy molds. 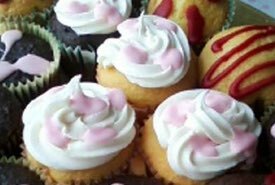 This cupcake decorating idea is so simple and delicious. 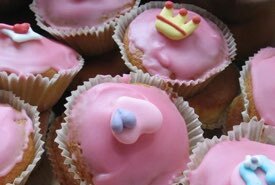 Just a little bit of warm glaze placed on a cupcake and allowed to set creates a beautiful and tasty masterpiece. Glazes are pretty simple to make. Just a little icing sugar, butter, and milk are needed. 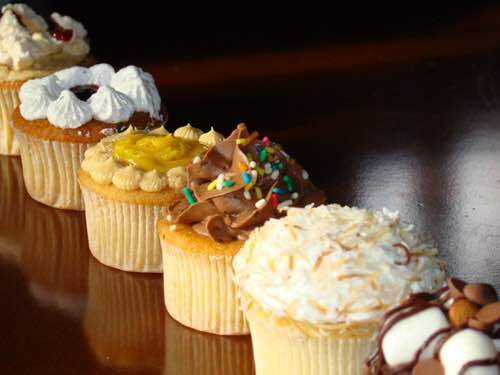 Try adding a favorite flavoring like vanilla or almond to your glaze to compliment the taste of your cupcake. Most of the cupcakes above are very simply decorated. Just a swirl of icing, or some gel or piped icing to attract the eye. Mouth-watering decoration doesn't need to be complicated. If you're in a hurry and there isn't time to think about fancy designs, just use a swirl of brightly colored icing to make your homemade cupcakes really stand out. 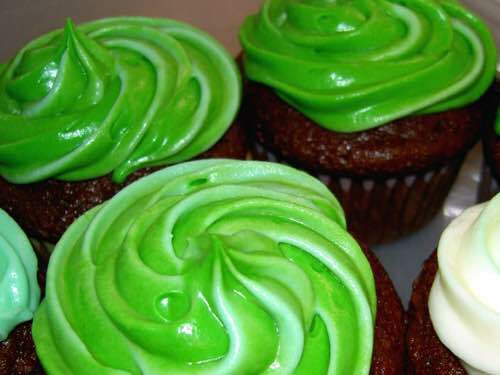 You can color your homemade icing or use a decorator's icing spray to get the bright colors you want. 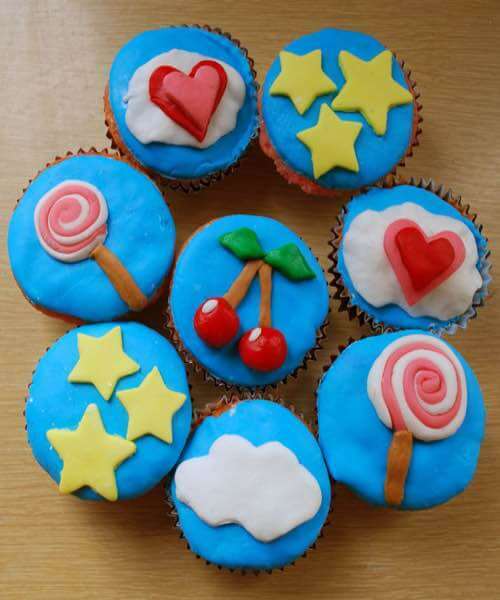 The sky's the limit with cupcakes. 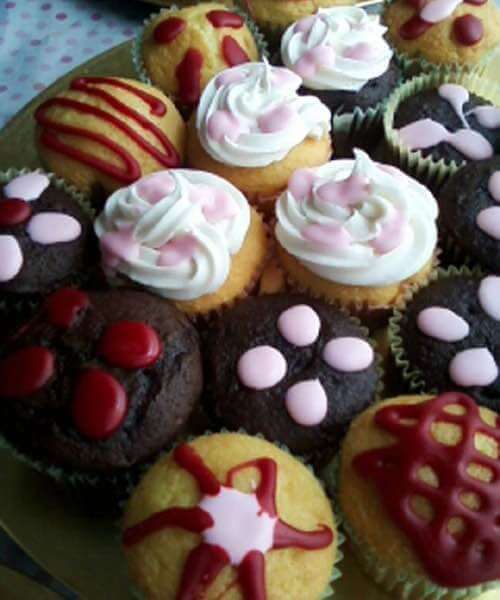 Each cupcake in your batch can be made to look different if you want. Try a rocky road theme with chocolate, marshmallows and graham crackers. Maybe you'd prefer to top your cupcake icing with shredded coconut. Or, go for the simple look and add a little frosting and colored sprinkles. People love a choice. Turkey drumsticks with mashed potatoes and butter, and green peas? Now that IS different. It's perfect "cupcake combo" for Thanksgiving. Isn't it just amazing what you can do with a little icing, some marshmallows, store-bought candies, and chewing gum? 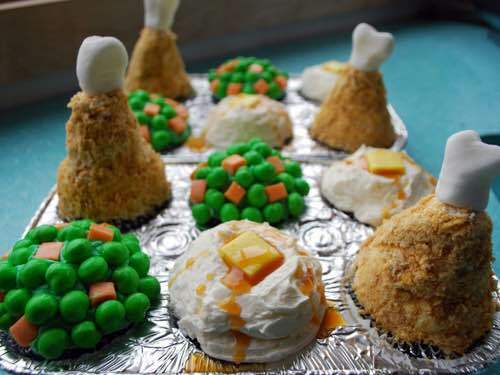 The unusual cupcakes in the above photo were inspired by cupcake decorating ideas featured in the cookbook, "Hello, Cupcake!" by Karen Tack and Alan Richardson. Watch the above YouTube video, as the book's authors demonstrate how to make Corn On the Cob cupcakes. Then, visit Amazon and get the "Hello, Cupcake!" Kindle book. It describes how to do imaginative decorating using candies commonly found in local stores and ordinary utensils found in your home kitchen. As you can see, there's really no end to the simple cupcake decorating ideas when you release your imagination. 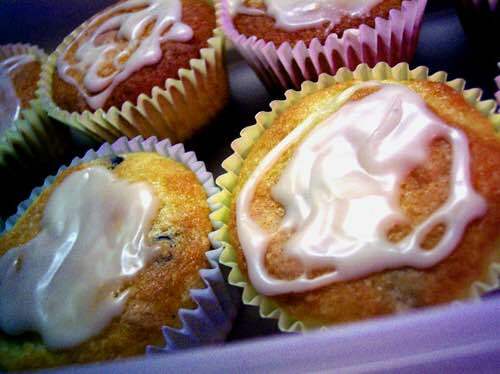 Aside from an icing bag and tips, no fancy equipment or skill is needed. You will be amazed at what you can accomplish, and you'll have loads of creative fun doing it.